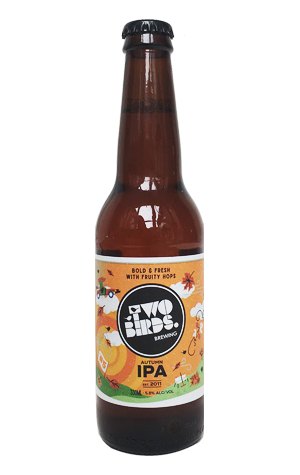 As the AFLW collab Trail Blazer joins the Two Birds lineup on a more permanent basis, it's followed out of the Spotswood brewery by their autumn 2018 seasonal. It's another IPA from the brewery that's had a lot of fun with the style in recent years, from the glittery Bowie tribute Stardust IPA to versions inspired by piña colada and lemongrass tea. Here, it's a rather more straightforward affair, just hops (Amarilla, Simcoe and Topaz), malt, water and yeast. The brewers talk of an IPA that's "fiercely fruity ... with notes of passionfruit and mango puree", although it has us thinking more of English IPAs. Maybe it's the autumnal colourings of the label, the talk of "walking through fallen leaves in your favourite pair of boots" in the tasting notes, or the fact the Crafty Pint family will be boarding a flight for the chills of the UK before most of you get a glass of this to your lips, but it might also be due to the slightly nutty, toasted malt character within the clear, nigh on copper brew, and the earthy, twiggy nature of the hop bitterness.